The window of the Hotel Ukraine from which, a BBC reporter said, shots were fired by a man "wearing one of the protesters' green helmets." Although ACLOS is a wiki dedicated to events in Syria, we couldn't help but notice a very familiar pattern in the recent culmination of unrest in the Ukraine. Our research has led some contributors to believe that part of the reasons for escalation in Syria and other places have been snipers of unknown identity shooting at both protesters and police forces. 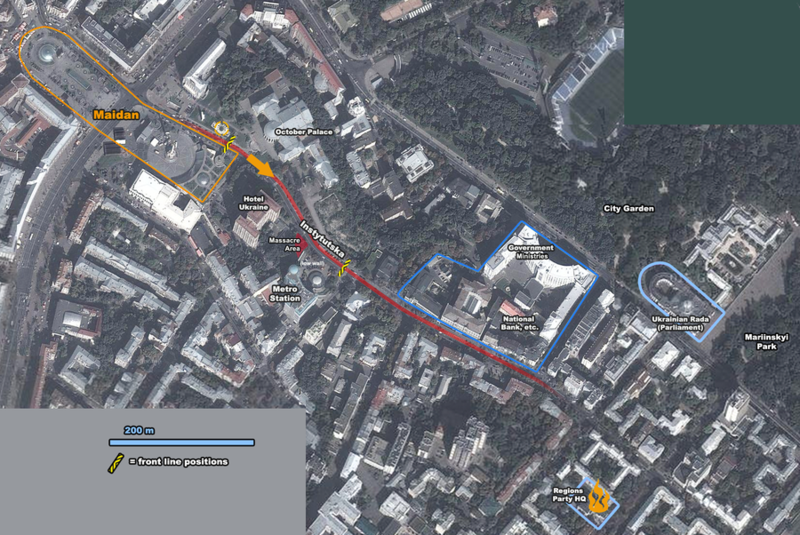 And as also many of the other events examined on this wiki have two sides accusing each other of being responsible for despicable acts of this or the other kind, we couldn't help but take a closer look at the events of February 17th to 20th in Kiev, the capitol of Ukraine. Most of it can be found on the talk page at the moment, but some is already front page material if only to honour the victims. The list of victims includes at least 67 insurgents and civilians and 11 police. This broad area map shows the relevant locations for the pivotal events of February 20. The hotel Ukraine, generally insurgent-held, seems to be the origin of at least a majority, if not all, of the truly criminal and relentless firing on unarmed protester/insurgents. That occurred, video clarifies, in the red area at the map's center. There's no clear evidence ACLOS has found of peaceful protesters getting shot on the Maidan itself. Until it's settled enough to summarize here in full, evolving details on the area can be found in the talk page section Mapping the Events. Alleged shooting directions are mapped and considered in the sub-section Talk:Ukraine 2014#Shooting Directions. 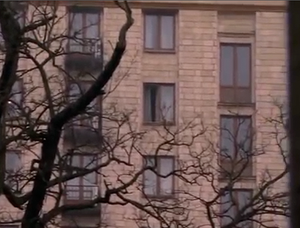 From Crimea documentary-Putin interview- Opening part, interview at 8:00. 20 February 2014, 18:40 (Moscow) Yanukovich-Putin phone call; 23:30 (Moscow) Merkel, Cameron calls (extreme concern expressed; Russia's human rights representative Lukin goes to Kiev). Michael McFaul interview. Q: "Recently, Lavrov told his version - when they agreed, Putin called Obama and said, "So we pressed on him, they signed, now you have to put pressure on the opposition." In his logic, he imagined that someone could put pressure on the Maidan, although it was no longer possible. Yanukovych ran away at night . Lavrov said that "offended the president, that no one called back from Washington, and even did not say that they had tried to convince, but were not able to." At this point, it was sealed, and he had decided to take the Crimea". A: "I agree, it was probably the moment when he decided to start this operation, and this is extremely important. Because many say he dreamed of this for a long time". 22-23. 2. 2014 Yanukovich goes from Donetsk to Crimea. Russia intercepts communications suggesting that Yanukovih will be ambushed, possibly killed. Yanukovich informed. While in contact with him, a rescue mission is ordered; choppers and commandos extract Yanukovich cortege from a beach-side location. Yanukovich still goes to Crimea for a few days, than leaves to Russia. 23 February 2014, 18:20 (Moscow) Merkel-Putin phone call. (Olympic games congratulations and Ukraine) (23 February is the Soviet/Russian Army day). Statement of the International Advisory Panel on the occasion of the first anniversary of the beginning of the Euromaidan crisis on 30 November 2013. The panel, first convened in April, 2014, does not conduct its own investigations, officially. Instead, it reviews investigations of Maidan (and also Odessa) events, still conducted by Ukrainian authorities, to determine if they are up to European Human Rights standards. Whether or not the findings are true is another question that aren't necessarily mandated to address. The Panel, chaired by Sir Nicolas Bratza, former President of the European Court of Human Rights, is made up of three members, the other two members being Mr. Volodymyr Butkevych, a former judge of the European Court of Human Rights, and Mr. Oleg Anpilogov, a former prosecutor of Ukraine. The effective investigation of unlawful killings and serious ill-treatment is all the more crucial when those violent acts constitute a turning point in a State’s history, as they were in the case of the Maidan demonstrations. In such cases, investigations and prosecutions, bringing as they should truth and accountability, constitute an important means of ensuring a solid transition from that episode of violence to the next more positive chapter. This is, indeed a form of transitional justice. ... the International Advisory Panel (hopes to) make a lasting contribution to restoring public confidence and to bringing closure to both these unhappy chapters in Ukraine’s history. The 100+ pages report of the panel, released on March 31, 2015, concludes that no significant progress has been made in the investigations and criticizes mostly Avakov's Ministry of the Interior, but also the security service, of an attitude that "has been unco-operative and, in certain respects, obstructive". On October 12, homes of three members of "Freedom" party were searched on suspicion of their involvement in the shooting of "heavenly hundred" during the coup in Ukraine in the winter of 2013-2014. This was announced on Twitter by "Freedom" deputy in Kievan Rada Alexander Aronets, who published a Kiev Pechersk district court warrant to search the homes of his colleagues. The document says that during the pre-trial investigation a video emerged in which we see an open window in room 1132 on the 11th floor of the hotel "Ukraine", from which shots were fired at civilians and law enforcement officers on the Independence and Institutska the street. It was found that Pankevich Oleg Igorevich (Freedom party) stayed in the room number 1131 during this period "- according to the court order. Rusvesna, 12.10.2015. Right-wing/nationalist Freedom party ('Svoboda') is led by Tiagnibok. Feb 5, 2016. SBU reported to Poroshenko that they finally found weapons from which the heroes of Maidan were killed. 23 weapons were found, which were damaged mechanically, ID numbers sawed-off. After an examination, SBU identified 12 weapons. Gritsak said: "with high probability, those were fragments of 22 Kalashnikov (sub-machine) guns, one Kalashnikov (full) machine gun, and in addition one barrel, a twelve-gauge hunting shotgun"
July 23, 2016. Ukrainian Attorney General Lutsenko: the person who lead 'the black hundred' (meaning snipers) out of Kiev and drowned weapons in a lake, was with us on Maidan -112.ua, text and video (Russ. and Ukr.) (He keeps saying that 'according to our version' it was done on orders of Zakharchenko). In late November 2017, the official investigations have been put on halt due to legal obstacles. They were to be transferred by the Prosecutor General’s Office to the State Investigation Bureau, alas lawmakers have failed to create such a bureau in time. Yanukovych said that the shooting at the Maidan was a planned as a special operation aimed at overthrowing the government in Ukraine. 14:56 Yanukovych: Shooting on the Maidan was a planned special operation aimed at overthrowing the government in the country (I think he said false pseudo-operation, which was rationally (?) planned and executed; up to terminology it's possibly the same). 14:51 Yanukovych: Ultra-right organisations sponsored by oligarchs were involved in the murder of "Maidan" activists and law enforcement officials, with the purpose to overthrow the government. Ukrainian 112.ua, and English version, had the same online webcast quotations initially, but now report on press conference after the court testimony and some assorted background; testimony itself is hard to find there, but it gives a link to Watefal, above, someplace. The “Snipers’ Massacre” on the Maidan in Ukraine – Ivan Katchanovski, October 1, 2014 - Paper presented at the Chair of Ukrainian Studies Seminar at the University of Ottawa, Ottawa. Ridus, 6 July 2016. Follow-up article quotes Katchanovskii saying that ballistic expertise showed that one victim, Victor Chmilenko, was killed by 30−06 „Springfield“ bullet, old US military version presently used in hunting and sport gear and not used by Berkut and other government entities, from that and the video concludes that he was shot from hotel Ukraina controlled by Maidan. (Video of killing and earlier article links included; ballistic expertise link and article source cannot be easily found). There's at least one decent photo-based study by a guy named Vorontsov, and other sources currently listed on the discussion page. 52 minute English language documentary on the Maidan Massacre. Berkut officers interviewed. Analysis of snipers. tvrain interview. He was a commander of Alpha battalion in the Donetsk region, and deployed on Maidan (currently commander of Vostok battalion, DPR, and DPR security chief). He with his group was at Trade Union building (he says 'that building), entering from the top and moving downstairs. Another group was supposed to move from ground level but was unable to. His group moved in with a motto 'we burn but we do not shoot back.' Battle order, man with a shield, followed by 1 or 2 men with pump gun; everybody else behind role was to extinguish fire; had weapons but were not using them. They found a door on the 7 floor locked, and some people on that floor trying to start a fire. They broke some glass, threw in some noise-producing police grenades, but were not able to fully open the door or to extinguish fire. Fire extinguishers were too small for the job; they made a water line from 8 floor but pressure was too low for firefighting. They noticed the fire on the 6 floor as well. Concluded there is no point to try moving down. Eventually, discovered that protesters brought in --as he say--corpses of pro-Maidan supporters killed elsewhere on Maidan. He says that there radio conversations were all recorded, but not made public. But recordings reporting fire starting on 2 floor (as he believes, fake reports), were published. Khodakovskii makes a point that there was more freedom/democracy before Maidan, and that current regime is build on lies. Tvrain is the only Russian channel broadcast to Ukraine, that was his reason to stop by for a 1 hour conversation on a broad range of topics. Believes that DPR/LPR will live in peace with Ukrainian people---but he is strongly opposed/strongly critical of the current regime in Kiev. (describing Hvila (Volna, the Wave special operation): Водночас снайпери отримали вказівку розстрілювати не тільки протестантів, а й міліціонерів (At the same time, snipers were ordered to shoot not only the protesters but also policemen.) --He blames Yanukovich officials though. Claim: back in 2012, Berezovskii had a Ukrainian dossier, predicting some/many/most of subsequent events in Ukraine....Komsomolskaia Pravda, 8.4.15-- Quoting his security man as a source. In the case of the shooting of "Heavenly Hundred " new helpers found, in the service of the junta (Vitalii Samusenko). Yurii Sobolta (Юрий Соболта ) is a man shown on most smaller photos in the article, some in company of the current regime figures. He had served in an elite special police unit Bars . On 18 of February, 2014, he drove away on a HONDA АА4774СО, which was stopped by Maidan crowd for a check at № 24/7 Institutskaia Street. A sniper rifle in the trunk of that car was discovered. Another, unknown masked person, drove the car prior to it being stopped. Crowd searched the car and discovers the rifle; than suddenly Sergei Pashinskii, said to be one of pro-Maidan leaders, emerged, to make sure that the car is released. The masked man initially driving the Honda walks away; and Yurii Sobolta takes over, with the sniper rifle still in the car. Gun is said to be Norinco_CQ A, a 5.56×45mm patron carbine. Sharii had a story about all this awhile ago. Apparently it was investigated; Russian wikipedia says gun was tested; but nothing came out of it. Ivan Bubenchik. A report attributes to him a confession of killing two Berkut commanders, using Kalashnikov, prior to other casualties. However, he disputes the report, says there is not a word about killing in his video. Georgian snipers, who previously served in Saakashvili security, reportedly confess to massacring along with Lithuanian snipers both police and protesters on the Maidan in a new Italian documentary film. Few more Gordon bits and still not all the way on audio here. Focuses on transgressions of Yanukovich, and mutes off when it comes to heavenly hundred story. Tells that he was himself a Maidan regular, for reasons of conviction, but moneys were involved to keep Maidan standing; mutes off whose money while hinting on the role of 'old guard' from Yanukovich side, unhappy with younger arrivals brought by his influential son, given undue powers. One night a man came to me, who introduced himself that he was one of the soldiers of the sabotage group. He said that they have a task to destabilize the situation in Kiev, including snipers among them. According to investigators, Alexander Schegolev, head of the Office of the SBU in Kiev and the region, commanded an "anti-terrorist operation" on the Maidan on February 18-20, and ordered the start of in-force/armed operation "Boomerang". Subsequently, fire occurred in the Trade Union building in Kiev, and 2 people perished. According to investigators, documents about the operation were destroyed right after the tragic events. Ex-head of Alfa confirmed that on February 18, 238 special forces of the Security Service got on the roof of the Trade Union House through the Khreshchatyk Hotel. However, according to his version, the House of Trade Unions was set on fire by the protesters themselves, and the spetsnaz officers tried to extinguish the fire with the help of fire extinguishers and hoses. Khodakovskiy took part in the 'Alpha' operation in the Trade Union building. He confirms the version that Alpha was trying to prevent casualties, fire, did not not use firearms. He claims that nobody died as a result of their Trade Union building operation, and blames Maidan for those deaths (claiming that those people were among those detained and mistreated by Maidan activists). He tells that the commander of the joint security forces group taking part in Trade Union building operation was Alexander Ustimenko, who was promoted by Poroshenko and appointed head of 'Alpha' SBU group. One of Maidan poster girls Yulia Marushevskaya appeals to the world, in English. Made head of Odessa customs by Saakashvilli in Oct. 2015. Stepped down in Nov. 2016 when Saak quits from the governor post. Investigated for corruption herself, Dec. 2016.